Get ready for some Glee news overload! Never Been Kissed will be aired tomorrow and it seems that the episode deals with bullying. Ryan Murphy has promised an episode that will deal on this and from what I read (on fan sites and forums) and see (on youtube) this episode might be it. Mark during filming last October 26, 2010. They were filming a wedding, hmm!?! 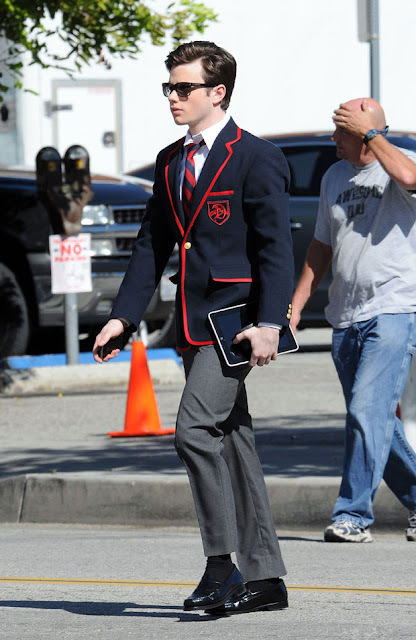 On other news, Kurt may really be transferring to Dalton. You want proof? Scroll down. But don't fret too soon, he'll be back just in time for Sectionals from what I hear. I hear they might be romance brewing between these two, but what about poor Emma! For more updates on Glee's 6th episode, wait for my next post. Son. Brother. Dancer. Singer. Friend. Lover. Believer. Fighter. God bless us all. Simple theme. Powered by Blogger.